The best way to determine if your pool, spa, or fountain is losing water due to a leak--and not natural evaporation--is to perform a bucket test. The following instructions are for a pool but will just as easily work in a spa or a fountain. Step 1: Place a 3-5 gallon bucket on the bench or first step of the pool. The water in the pool should reach two-thirds the height of the bucket. Put a stone or large brick in the bucket to hold it down. Step 2: Fill the bucket to the level of the water in the pool. In other words, the water inside the bucket should be at the same level as the water outside the bucket. 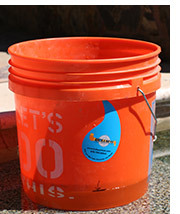 Step 3: With a piece of tape, mark and date the level of the pool water on the side of the bucket. Step 4: Run the system on its normal timed cycle and check the pool water level after 24 hours. If you have a combination pool/spa, isolate the pool and spa by closing the valves between the two and see which one leaks. Warning: Never let your pool drain to empty. As little as two pounds of ground water pressure can lift a gunite pool out of the ground. Thorough testing requires that the pool and/or spa are filled to normal operating level. We price our leak detections according to the type of system you have. So the price for a basic pool will be less than the price for a pool/spa combo, which will be less than the price for a system with multiple pumps and features, such as fountains or a disappearing edge. Note: We do not test portable spas. We do not resurface pools, and we do not perform major structural repairs. We are happy to refer you to a reputable, fully licensed contractor for such services.